See the landmarks that have inspired awe, grandeur, and reverence among the people of what is now Multnomah County, while travelling through some of Portland's most historic neighborhoods. 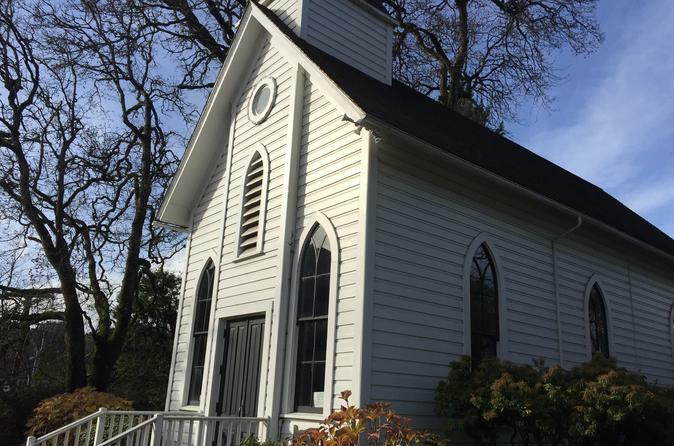 You’ll learn the local history, including the Native American stories honoring the 5 nearby stratovolcanoes and the Columbia River Gorge, as well as what Portlanders are up to these days, while taking in the splendor of Portland’s oldest and most beautiful churches, synagogues, and temples. Stops will be made that allow you to get intimate with views of Portland and the nearby stratovolcanoes, Oregon's oldest chapel, Portland’s oldest continuously-operating cemetery (and second largest arboretum), and Portland’s world-renowned Catholic sanctuary known as The Grotto. Coffee is provided, with a stop for food at a local bakery whose French baker has received France's most prestigious award for artisan craftspeople. Your guide will pick you up at your hotel in Portland by 10:00am. You'll begin with a stop at the historic Pittock Mansion, overlooking downtown Portland and Multnomah County from 930' (280 m), where you'll learn about the 5 stratovolcanoes that inspired the Multnomah people and other tribes that occupied NW Oregon and SW Washington, when the Vancouver and Lewis & Clark expeditions first arrived. After taking in the view at Pittock Mansion, we'll descend back to the valley floor and meander through the heart of Portland past churches, synagogues, and temples. Once on the east side of the river, we'll make a stop for a light lunch/snack. From there we'll continue wandering through the east side of Portland, where we'll stop for a stroll at Lone Fir Cemetery. Established in 1855, it is Portland’s oldest continuously-operating cemetery and second largest arboretum, harboring a diverse collection of heritage trees and hsitoric grave monuments. Next, we'll roam some more through east Portland before moving onto The Grotto, where you'll enjoy beautiful gardens, shrines, a chapel, and another awe-inspiring view. The end of the tour is a surprise -- one of your guide's favorite natural sacred spaces in the region. Your professional guide will provide commentary and conversation throughout the day. You'll be returned to your hotel at the end of the journey.